1. Heat cast iron pan over medium high heat, add 2 teaspoons of peanut oil, cook fajita chicken until fully cooked (reach 165F degree). Cube the chicken and set aside. 3. Place tortilla into deep fryer basket one at a time, fry for 2 minutes or until golden brown. 4. Lined a paper towel on a baking sheet, place fired tortilla on it to soak up excess grease. 5. 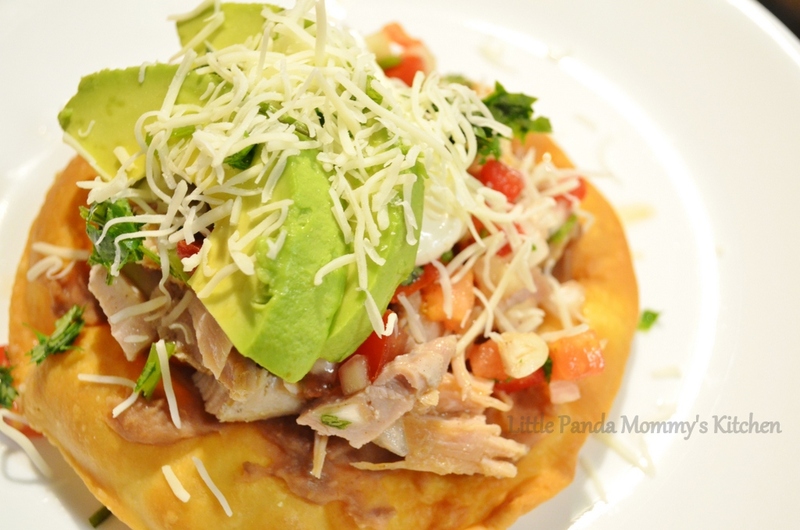 Start assemble the tostada as pictures below or any order you feel like, add or skip the ingredients as desired. Your recipes look so good and healthy! Where did you learn to cook? 🙂 That is awesome. Thanks! I’m a Mormon (member of the Church of Jesus Christ of Latter-day Saints) and the family is central to everything we do. And part of having a family is food… your recipes look simple and good, I will definitely have to try them!